Hope you weren't enjoying watching YouTube on the television screen, Popcorn Hour and other set-top box manufacturers have been given notice by the newly 1080p and network TV-friendly website that they are no longer welcome to access its content. The new Hulu-ish Terms of Service (section II, item 10) restricts API clients from the ability to "use the YouTube API in connection with any API Client created for use on television set top boxes, television game consoles, or video screens packaged and marketed as television sets;" according to Popcorn Hour COO Alex Limberis this applies to all with the exception of "a few strategic partner's Google has singled out" -- PlayStation 3, Wii, TiVo, Panasonic, Samsung and other licensed hardware is safe. 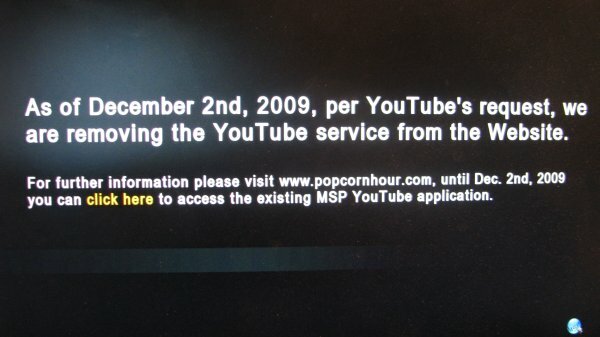 We've put in a call to Google to find out exactly when and where YouTube will work going forward, but until then that December 2 notice up there (as displayed on the C-200) means without a change -- or help from rule benders like PlayOn -- many TV streaming YouTube apps or devices could be a dead man walking.